1. What is this "provably fair" concept? 7. Are CasinoWebScripts' games provably fair? The myth: provably fair - just a marketing strategy or is it a real-thing? "Provably fair" is a concept created for the online bitcoin gambling world, due to the lack of a licensing jurisdiction that would control and monitor the activity of unlicensed online bitcoin casinos, from preventing them to cause fraud and cheat players. The concept involves offering a way for each player to verify that the odds and the game outcome were not manipulated by the server in order to make him lose. The only way to do this is to allow the player to add his influence to the game outcome, in the same way for each gameplay, but without him knowing the game outcome until the gameplay would be finished. This way he will influence something, but he will not know what, and he will receive all the details at the end of the gameplay. For example, in a normal casino you might think that the dealer can cheat when he shuffles the cards because he could arrange the cards in such a way so that he will get better cards than you. To prevent the possible attempt of cheating, you can ask the dealer to show you all the cards from the deck (to make sure that each card appears once), and then he can shuffle the cards and once he finishes, you can cut the deck. This way, no matter how good the dealer will shuffle his cards, he will never be able to cheat you, because you will influence the deck in an unpredictable manner and the dealer cannot make any decisions by himself since he must follow the game rules strictly for every scenario. This means that the dealer cannot win even if he knew the contents of the deck. The same anti-cheating strategy was applied when this concept was first brought to life, in 2013, by one of the first online bitcoin casinos. It involves shuffling the deck of cards, then hashing it (the hash represents and irreversible encryption) and showing the secured string to the player. Then the player can add his influence to the game outcome, by choosing an area from the deck where to cut it. He can do this by setting a client_seed and our algorithms will use his seed to shuffle the deck even more. 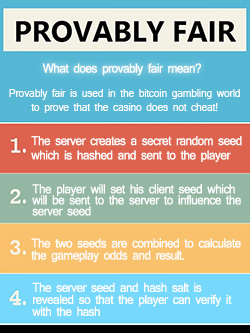 The formula used for adding the influence of the player to the final game odds, will always be the same for each gameplay, but because the client_seed and the server_seed are different with each gameplay, then the final outcome will always be different and the hash will always look unique. A deck of 52 cards has 2^225 possible combinations (that is a number with more than 65 zeros at the end). Once the provably fair gameplay is completed, the user receives the secret salt used for hashing the initial deck, and this way he can verify if the presumed hash matched the initial deck. 2. How does the "provably fair" concept work? The player must follow the next steps to experience a "provably fair" gameplay. 1.Request the shuffled deck (server_seed) from the server, using the tool from the left of the browser window named "Prov. Fair". 2.The player must set his client seed to add his influence to the shuffled deck, to prevent any data being manipulated by the server. 3.After the above points are done, all he has to do is to play the game by clicking SPIN/DEAL/ROLL, depending on the game. Steps 1 and 2 can be skipped by enabling the "Autoset" checkbox from the "Prov. Fair" page of the game that is played. Each gameplay can then be verified from the LOBBY -> GAMEPLAY HISTORY page, by clicking on the VERIFY button. This will reveal the initial deck, the salt, the hash string, the final the deck and the player can verify everything to see if the final outcome matched the pretended outcome and if his client_seed was used correctly. Security comes first in any business, especially in the online casino business. The algorithms that we have chosen have proved to be secure over many years and there are no flaws in their design. For hashing the deck and sending it to the player, we are generating a salt and then we are hashing the deck+salt, using one of the most secure algorithms, SHA-256. Hash algorithms are irreversible, which means that there is no way to decrypt or decode them. The only way to verify if a hashed string matches an original input is to have access to the original input and the salt. The salt is a string that is attached to the original input, in order to make the final string random, before it is being hashed. This adds a 100% security level to the algorithm. Once the gameplay ends and we know that the player cannot influence the outcome in a malicious way, our system will make public the original input(the shuffled deck) and the salt, so that anybody can perform their verifications. The provably fair concept comes with many advantages, the most important being that it makes your players to feel secure, knowing that their chances of winning are fair, when playing at your casino. The users can verify if the odds were fair with each gameplay and once they feel secure, they will continue to play. Each game has a house edge and on the long run and the casino will always win, but in a fair and known way. The only disadvantage that can be brought in discussion is represented by the fact that the player has to perform some extra clicks to verify each gameplay and that the RNG of the casino is no longer used at its full capacity, since the final outcome will not always be influenced just by the server, but it will be influenced by the server and the client. However this implementation will make every player feel secure, if anybody has any doubts regarding the fairness of the casino. The system is meant to prove the fairness of each gameplay to the people that are doubting it. Despite the optimism of a Forbes columnist towards the Provably Fair concept, there are not many casinos willing to alter their certified RNG in order to provide to their users a way to verify the gameplays for validity. Therefore if very few casinos will adopt this system, players will continue to play no matter if a casino is Provably Fair or not, since their options to play at a Provably Fair casino, are not that big. There are less than 1% Provably Fair casinos and probably the numbers will stay under this percentage for the next few years. After all, the best way to prove if a casino is legit, is by obtaining a gambling license and having the licensing jurisdiction to inspect and monitor the server. Since its initial release, the "provably fair" concept has suffered multiple modifications in terms of logic and security, until it reached a non-breakable method that nobody can doubt or can hack. Today, the "provably fair" method is the only way to prove that a casino does not manipulate the outcome of its games, besides a monitoring system installed by the licensing jurisdiction, where all the files are verified and all server activity is monitored against possible changes. Our provably fair implementation will set the server seed(shuffled string) and then the player can influence it using the client_seed. The client_seed influence can be applied just once, to the server_seed. Then using our tools, the player can see the original server_seed and the client_seed and the final outcome after the client_seed influence was applied to the server_seed. By allowing the player to check all this data, we guarantee that we are applying the client_seed influence, just once. The large demand of a way to prove that the games are fair have made us to implement the provably fair system in all our slot, dice, roulette and card games. At this moment we have more than 100 provably fair casino games available for sale with or without source codes. We will continue the game development at the same pace and all our new titles will be provably fair. Unlike other systems, ours allows the player to verify the gameplay and the hash, right after the gameplay will be completed, instead of having him wait until the next day, when the "secret salt" is published on our website. We consider this a huge advantage over the other systems, because in the century of speed, nobody wants to wait a day to verify if they were treated fair or not. The last quarter of 2014 will bring not only "provably fair" flash games, but also mobile games and "provably fair" mobile games into CasinoWebScripts' catalogue. The games will follow the same provably fair algorithms.